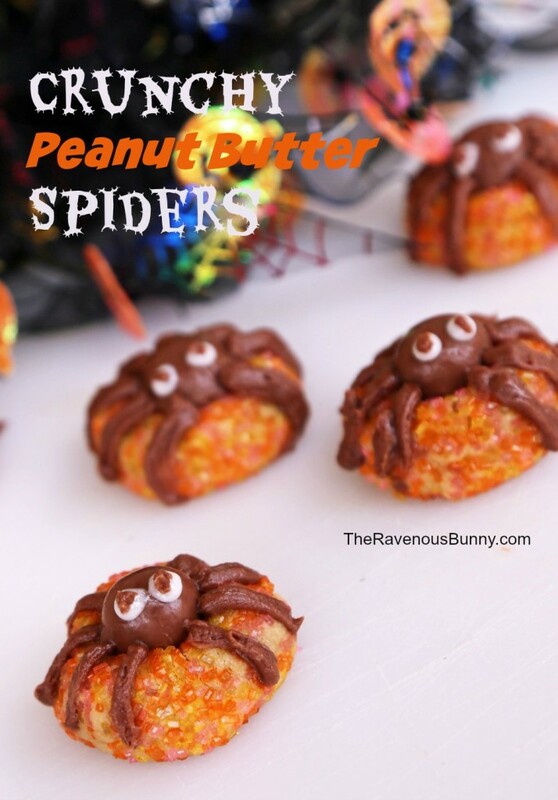 This is really just our peanut butter cookie recipe dressed up a bit for Halloween. 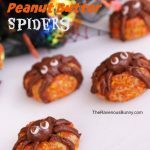 I’m not 100% satisfied with the spiders, I think I could have done better but overall it’s a cute cookie. Oh yeah, and it tastes freaking delicious. The crunchy part does not come from using crunchy peanut butter rather it’s the large sugar crystals on the outside. I tried both mini Reese’s peanut butter cups and Whoppers for the heads. I thought for sure I would prefer the peanut butter cup just because of the whole similar taste profile thing but surprisingly I didn’t. The whopper held shape better and tasted good with the cookie. Ultimately I would have used Hershey Kisses but the shape was wrong. The cookie recipe has not changed except with these you want to make them bigger. You are going to form approx 1 Tablespoon of batter into balls and then roll into sugar crystals. Cook for 6 minutes and then when they come out of the oven, transfer them carefully to an area to cool and immediately put the “head” on. Once you do this, leave it. It will melt but if left alone, it will set up perfectly. For the legs and eyes I would recommend buying the icing in the grocery store that is already in a piping container. I made my own at home and while it tasted good, they were not as neat as I would like. This cookie is designed to have an almost under cooked quality to it. It’s not raw and it won’t kill you. Add the Egg, milk and vanilla and blend for another 30 seconds. In two batches add the flour, baking soda and salt. Using a spatula, mix until just blended through. Roll each cookie in your palm and then place in a bowl of colored sugar. Carefully roll it around until coated and transfer to a parchment paper lined cookie sheet. Remove from the oven and add your center candy immediately. Allow to fully cool before decorating with icing.